Background: Preeclampsia complicates 2-8% of all pregnancies worldwide and is one of the leading causes of maternal and neonatal morbidity and mortality. It occurs after the 20th week of gestation and is characterized by high blood pressure, proteinuria or end-organ disease. The heterogeneous and multi-systemic nature of this disease has led to the elusive pathophysiology which delays timely diagnoses and the clinical treatment of those affected. Objective: Despite the extensive investigations surrounding the inclusion of various potential markers for PE prediction, early diagnosis remains unresolved. Quantification of copeptin, a stable component of the arginine vasopressin (AVP) precursor is shown to be relatively reliable in confirming the circulating levels of AVP. Conclusion: Elevated copeptin levels confirmed in pregnant women have also provided clinical support for its role in PE development. 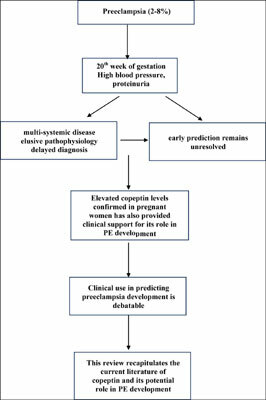 However, its clinical use in predicting disease severity in early-onset pre-eclampsia has been debatable. This review thus recapitulates the current literature surrounding copeptin and its potential as a risk indicator for PE development. Arginine vasopressin, copeptin, preeclampsia, pregnancy, biomarkers, high blood pressure.